Try this simple gravy kofta and enjoy. 2 tbsp of chopped mint. 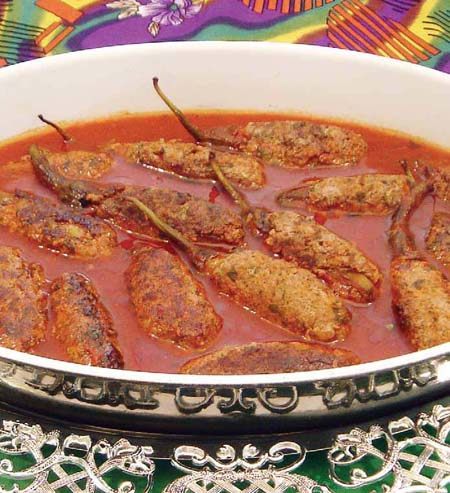 In a bowl combine The Kofta ingredients except green chilli an set aside. Wash green chilli and drain out all the water. Take ball size mince mix and cover the chilli leaving the green stems. In a pot non stick pan heat oil and fry the kofta until brown on all sides. In the same oil add Onion, tomato blend, salt, black pepper and garam masala fry for 2 min then pour in the water. Once the water starts to boil Add in the Koftas and cook over low flame for 20/25 min and gravy is slightly thick. Bring out in a serving bowl and garnish with mint . Serve hot with white rice or white Pilaf. Another winner. A great recipe. I do enjoy trying you recipes as always.Thanks Rabz. Thanks christy 4 always being supportive. Nice and different kofta recipe rabz!.Happy cooking!. Sorry viewers: After blending Tomatoes, tomato pure and red chilli powder u need to strain the tomato blend in a strainer to get a fine soupy texture.